This fruit-filled cake recipe is guaranteed to please and it will make a beautiful festive addition to your Christmas table. 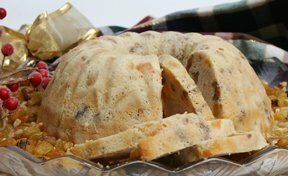 Even those who are not especially fond of fruitcake for the Holidays will love this delicious lighter version. Have your holiday table looking perfect by choosing just the right table setting for your special occasion. See how easy it is to make this delicious hot festive tea for the holidays. Everyone will love this special treat.